What is Bill of Material (BOM)? 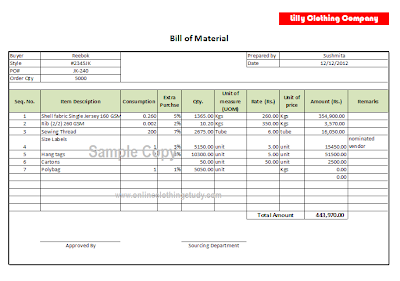 Bill of Material is a list of raw materials needed to be sourced to make a garment and make it ready for shipment as per buyer's requirement. In garment manufacturing, BOM is generally prepared by production merchants. Then has been approved by the responsible person and handed over to purchase department to start sourcing of raw materials. A BOM normally includes items description, consumption (per piece consumption) with a defined unit of measure, projected cost per unit and total cost of each item. See the following format. Fabric consumption and material consumption are calculated separately and added to the BOM sheet. Following one is an example of the BOM format. BOM are prepared on a spreadsheet or by ERP. 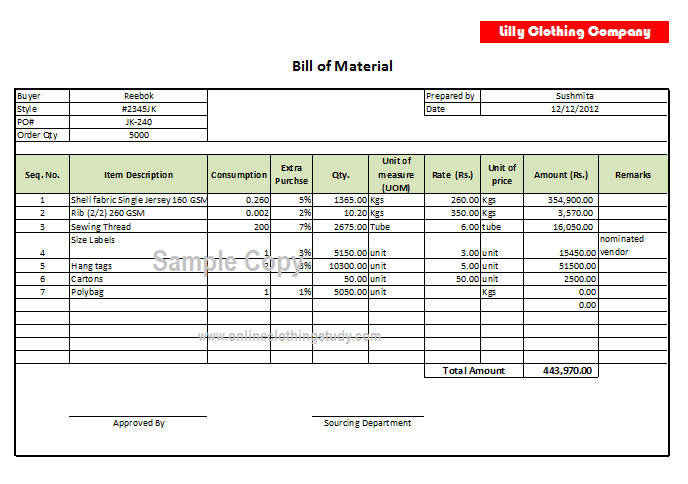 Sample format/template of a Bill of material used in garment cost estimation.